Earlier today thousands of truckers moved into the Capitol Beltway around Washington D.C., choking traffic for miles as they descended into the District and arrested several members of Congress. It was a thrilling sight for bored tourists unable to get into the Air and Space Museum. Wait, that didn't happen. That's the story I would have written had the Truckers Ride for the Constitution gone as some organizers said it would. Clearly, it did not go down that way, with — to quote Fox News — dozens, not thousands, of truckers showing up for the protest. Maybe they were deterred by the continual rainfall the D.C. area has had for days. Maybe the truckers realized they had actual work to do transporting goods across the country. Or maybe they just realized it was a dumb idea. Regardless of the reasons, the trucker protest seems to be a bust at the moment. The Washington Post reported traffic jam ups due to rain, but nothing from the event itself. NBC News reports that about 30 trucks came into the Beltway around 8 a.m. only to split into smaller groups. And a drive up 495 by this reporter revealed plenty of traffic and bad weather, but no signs of freedom-loving truckers or their supporters. 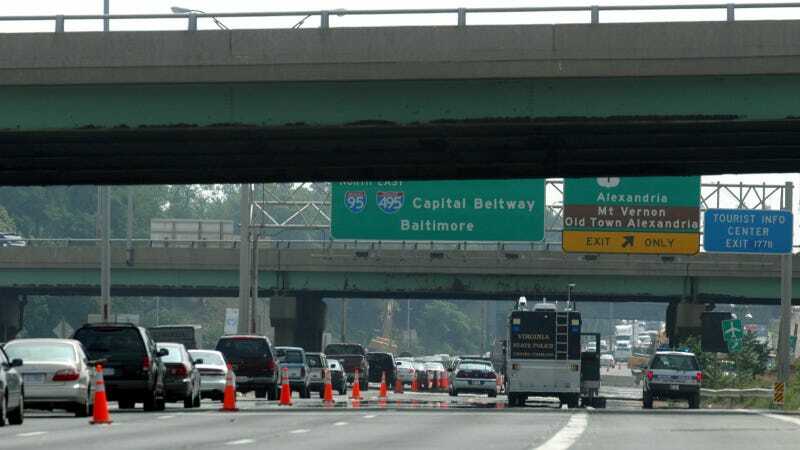 The rolling protest is supposed to go on all weekend, with truckers repeatedly circling the Beltway "three lanes deep" until their demands are met. We'll see if it gets worse. They'll need more of a turnout for that to happen.